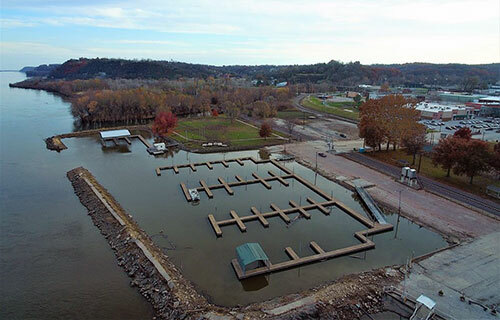 Nipper Marina is located at the foot of Broadway on the Mississippi River. The marina was dredged and new docks built in 2005 and 2009 (additionally dredging was done in 2011 and 2013). Amenities include boat launch, long term slip rental, and short term & overnight rentals. There is no electricity available in the slips and fuel is not available. Docks and office are wheelchair accessible. Call the HPR office at (573) 221-0154 for seasonal, monthly, and overnight rentals (Marina Fees). Boats are allowed to park in the marina April 1st through October 31st. All boats must be removed by November 1st. There is no winter storage option. For other inquiries (Monday-Friday 8 am – 5 pm) call the HPR Office at (573) 221-0154. 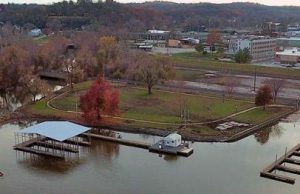 Nipper Park and Nipper Marina are currently under construction. 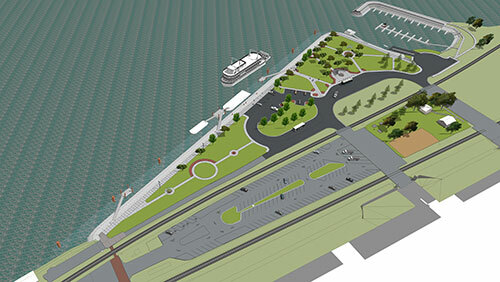 Below is an artists rendering of what the new park and marina will look like when complete.